Stringfellow Technology Group provides a broad range of technology services to our Clients. Our team is comprised of talented individuals from diverse backgrounds. All team members participate in continuing education, certification exams, and cross-training. They are the key to Client satisfaction and are dedicated to their business success. Stringfellow understands that positive, enthusiastic employees bring that attitude to the Clients they serve. Please review our open opportunities or Refer A Friend below! We're asking you to help us help you. 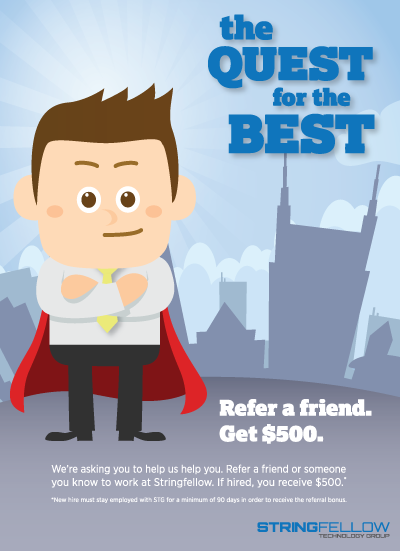 Refer a friend or someone you know to work at Stringfellow. If hired, you receive $500. *New hire must stay employed with STG for a minimum of 90 days in order to receive the referral bonus.